Magnolia Place is a quiet 55+ community in Lowell, North Carolina. Homeowners truly own low-maintenance homes at a reasonable price. Situated just west of Charlotte, Magnolia Place enjoys a convenient location near Highway 23. A nicely appointed clubhouse and neighbors who share the same interest, makes Magnolia Place a wonderful community for active adult homebuyers in Central North Carolina. Residents of Magnolia Place take advantage of having their very own, private clubhouse. This 1,200 square-foot clubhouse has plenty of card tables to enjoy a game night and a catering kitchen to snack with neighbors during community parties. There is not a formal activities director, but residents frequently plan outings and social events throughout the year. Evergreen Development constructed Magnolia Place between 2001 and 2009. Magnolia Place has 53 single-level townhomes that feature a full brick veneer and carports. Homes range from 1,290 to 1,462 square feet and include two bedrooms and two bathrooms. In addition, upgraded features such as hardwood floors, granite countertops, 42-inch cabinets and tray ceilings adorn the homes of Magnolia Place. 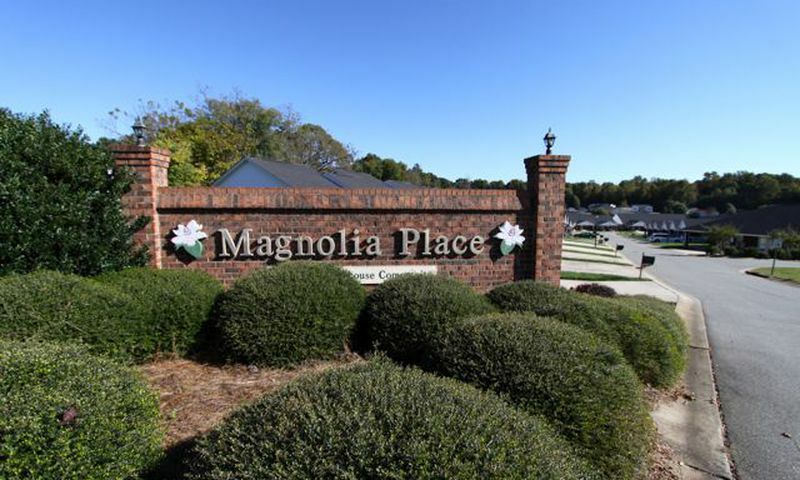 Magnolia Place is located just off exit 23 on I-85, 18 miles west of Charlotte. Residents enjoy great shopping and dining opportunities within ten minutes of the community. In addition, Charlotte Douglas International Airport is only 20 minutes away and downtown Charlotte is accessible via a quick 30-minute drive. The region s mild weather, convenient location, and tight-knit community feel makes Magnolia Place a great place for active adults. Clubhouse - 1,200 Sq. Ft. Check back soon for more information on the lifestyle in Magnolia Place. There are 53 ranch townhomes that make up Magnolia Place. These low-maintenance residences have brick exteriors, two bedrooms, two bathrooms, and a single or double carport. Many homes range from approximately 1,290 to 1,462 square feet in size. 55places.com is not affiliated with the developer(s) or homeowners association of Magnolia Place. The information you submit is distributed to a 55places.com Partner Agent, who is a licensed real estate agent. The information regarding Magnolia Place has not been verified or approved by the developer or homeowners association. Please verify all information prior to purchasing. 55places.com is not responsible for any errors regarding the information displayed on this website.